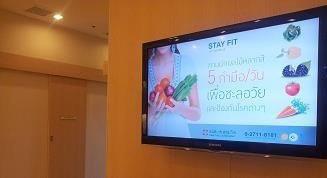 Hospitals, Medical Clinics, Dentist Chambers are realizing the benefits of using Digital Signage in the reception areas, waiting rooms, cafeteria, and other public areas to deliver informative and engaging content, health tips, information about their facilities, rules and regulations to visitors. Ryarc CampaignManager provides complete solution to medical institutions to deliver content to their Display screens, interactive touch screen kiosks in the public and staff area to deliver engaging content and information. CampaignManager provides enterprise level features for remote management, publishing, monitoring, logging, proof of play and versatile playback capabilities for all standard media formats be it images, flash animation, regular and HD videos, live web content, RSS tickers, xml feeds, in a seamless channel. It also allows interactivity between mobile devices and screens allowing visitors to choose the information they want to see. Combining a user friendly interface with unparalleled scheduling power, security and flexibility, CampaignManager is a tried and tested solution which can be trusted to run a single display, or thousands of screens across hospital network. CampaignManager supports both Windows and Android devices and is available in cloud as well as on premise options. Screens should be located ideally near waiting areas and at other strategic places.